Beginning with the Congress of Vienna in 1815 and extending to the elections in November of 1986, this history of modern Austria has been written for the general reader and the student wishing an overview of the country's recent history. The first part of the book, covering the years from 1815 to 1918, includes a discussion of the events in Habsburg history that have a particular significance for the evolution of the later republic. Particular attention is paid to the unique aspects of the Austrian governmental system. 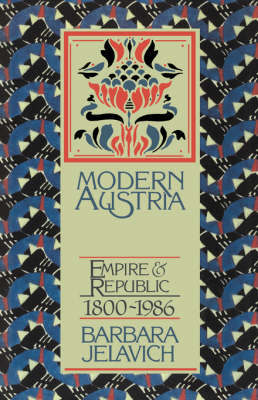 The book concludes with an examination of the Kreisky era, the evolution of Austrian social democracy, and the political controversies after 1983.The main emphasis in the book is on political history and foreign policy, but attention is paid to the cultural history of Austria, focusing particularly on Vienna, throughout the nineteenth and twenieth centuries.